How true of the French officer during the period 1853-1856 is this? French Army officers were promoted according to the Law of 14th April 1832 (the Loi Soult), which replaced that of 1818 (Loi St Cyr) and radically altered the way officers and other ranks were promoted and rewarded. The law of 1816 dictated that officers had to remain in each rank for four years before being eligible for promotion - therefore, no matter how talented the officer it would take a minimum of 18 years to be promoted to colonel. Eligibility for promotion was primarily based upon an officer's own merit, but also the seniority of their commission and, usually, their favour or ‘protection’ with senior officers. There were two routes to promotion: from the ranks, or by direct commission from St Cyr. Officers were now expected to have had a good education up to university level and be graduates of the École Polytechnqiue or St Cyr. Potential recruits for the officer corps had to be aged between 20 and 30, be taller than 1m 56 and be expected to serve a minimum of ten years in the Army. Twenty years later Napoléon III ordered that officers should all hold a degree prior to starting their training as officers. This was an attempt to improve the quality of the French officer corps but had the unforeseen disadvantage of restricting the officer corps to middle class families, as it was only they who could afford to send their sons to the best schools. The French army generally lacked highly educated officers as those candidates with the best examination results at St Cyr would pass into the elite Staff Corps (Corps d’État Major) leaving the ‘dregs’ for the infantry, a situation compounded as, unlike the other arms of service, the infantry did not have any specialist ‘Schools of Application’ to further training of infantry officers. Infantry officers were assumed to continue their study in private once they had graduated. Officers destined for the cavalry attended the Cavalry School at Saumur: where they were taught a very thorough if theoretical curriculum. Saumur also taught the Officers and NCOs of other mounted branches such as the Artillery and Train des Equipages how to ride in French army style. Officers could volunterr for the cavalry witih a direct commission and Saumur saw itself as socially superior to the other French 'Schools of Application'. ‘A fair knowledge of Mathematics’ was required for entry into St Cyr, and the lectures (and examinations) were in mathematics, science, modern languages, military sciences, geography, history and statistics; in addition all the students were taught to ride as well as the ins and outs of infantry, cavalry and artillery drill. Those officers who passed their examination in the ‘1st Class’ were eligible for admittance into the Special Staff School (École d’Etat Major) as a Sous-Lieutenant in Paris. The curriculum included modern languages, mathematics, and trigonometry, the study of artillery and fortification, military administration and bookkeeping, field sketching, statistics and manoeuvres of troops on campaign. Officers would study there for two years learning the duties of a Staff Officer, passing into the infantry with the rank of lieutenant as the Adjutant-Major for two years, before passing into the cavalry for a further period of two years before finally joining the État Major with the rank of captain. There was, of course, a way to circumvent St Cyr. Sons from a wealthy background who perhaps lacked the education to enter St Cyr or from families who could not afford to send their sons to good schools, but possessing military attributes, could enlist as a volunteer as a simple soldat. Even sons from noble families could be found serving a privates or NCOs as a way of becoming officers and this was not considered unusual in anyway. Promotion for these volunteers was often very rapid because they were literate and better educated than the vast majority of the conscripts. The same was true of the Etat Major; whilst generals had to chose their staff and Aides de Camp from qualified officers of the Etat Major, many resented this intrustion into the selection of their staff. They appointed their own personal staff, or 'Cabinet' from officers known to them and officers with whom they had worked in the past and had a good working relationship: something considered vital to the effective management of a division or brigade. Thus, the Etat Major was cirucmvented and could be further circumvented through the appointment of Officiers d'Ordonnance (Ordlery Officers) from amongst family members or as a way of gaining favour with superiors: for example General Canrobert had as his Officier d'Ordonnance Pierre de Castellane, the son of a Marshal of France! For other young, ambitious officers, getting an appointment as an Officier d'Ordonnance was a means of getting noticed and therefore promotion. Promotion was based upon two principals: election and seniority of commission. Officers had to spend a minimum of two years in a rank before being promoted. Up to the rank of captain, officers were promoted on the basis of their seniority or merit by a system of election; 2/3s of the officers to be promoted were elected by the senior officers based on merit and the remainder by seniority. Any vacancies amongst the ranks of Sous-Lieutenant were to be filled from the sergeants and sergeant majors of each Battalion, after their names had been suggested by their lieutenant, company captain and the Chef de Bataillon. Promotion from Sous-Lieutenant to lieutenant was automatic after two years continuous, good service and passing the lieutenants’ exam. To be considered for promotion to Sous-Lieutenant, a sergeant or sergeant-major had to have an exemplary record and a testimonial from their company captain and Chef de Bataillon. When an NCO was promoted to Sous-Lieutenant they were promoted away from their old Battalion so as to break friendships and ties. Officers proposed for each rank had to be submitted to their Chef de Bataillon who in turn took their name to the Lieutenant-Colonel and also to the senior officers in committee. The committee was Chaired by the Lieutenant-Colonel and consisted of the Major and Colonel of each regiment. The final arbiter for promotion was the Minister of War. A Lieutenant had to spend four years in that rank before being eligible for promotion to 2nd Captain, and the rank of 1st Captain was based on seniority of commission. The rank of Chef de Bataillon was chosen from two of three candidates chosen from the most senior 1st Captains, and was based entirely upon merit. Promotion from Lieutenant or Sous-Lieutenant to Captain was reduced to two years in June 1855 due to the lack of officers caused by the Crimean War. French Army pay was notoriously low. In 1836 it was calculated that the pay of a Sous-Lieutenant was the equivalent of that of a Parisian bookkeeper or junior clerk! The pay of officers had not increased from 1780 to 1830, because the officer corps of the ancien regime army was usually considered to be sufficiently wealthy so that their official pay became an honorarium. As a result, after the revolution of 1789 the morale of the officer corps was very low. The restored Bourbon monarchy (1815-1830) deliberately kept the pay of officers low so as to deter middle class officers and promotion from the ranks. There was considerable resentment between officers of the Line and the Royal Guard, the latter receiving double or triple the pay of the former. The most vied-for rank amongst officers was that of captain as it was only that rank that an officer was actually able to live off his pay. Under the July Monarchy (1830-1848) pay and conditions for officers were considerably improved but still did not ultimately meet living costs for officers. In 1836 a 1st Captain was paid 3,600F per year; a 2nd Captain 3,000F per year; 1st Lieutenant 1,875F per year and a 2nd Lieutenant 1,650F per year. It was estimated that from his monthly take-home pay of 95.83F, a Sous-Lieutenant had an outlay of 123F. In order to offset this, officers received money from which to pay their mess and accommodation bills and a gratuity for travel costs, which varied according to distance travel and mode of transport. The belief held in Britain that French officers were 'well paid' is totally unfounded: a French Lieutenant received 1,250F per year whilst his British counterpart was paid 2,975F. As a result of this low pay, morale amongst officers was low and apathy was high. The most vied-for rank amonst French officers was that of Captain as it was only at that rank that an officer could actually live from his take-home pay, albeit very frugally. If pay was low, then so too were officer's pensions which were the lowest in Europe. In 1836 a Lieutuenant could receive a maxmimum annual pension of 1,200F, and a Captain 1,600F. Pensions were available to officers who had served 25 years but if an officer retired after 20 years service due to ill health or personal reasons could still draw a pension so long as they were available for military service. Widows were entitled to half of their husband's pension. The minimum annual officer's pension was 350F per year and 150F for a widow! The French army was based on partial conscription; each department had to provide a ‘class’ of potential recruits each year who had to be aged between 18 and 30 and more than 1m 540 tall. Every eligible potential recruit in a Department was assigned a number and took part in the annual ‘lottery of service’: if their number was drawn, then they were conscripted. Conscription was for five years with a compulsory two-year reserve obligation, giving a total of seven years service. Military service was for maximum period of 22 years, but wealthy conscripts could ‘buy out’ of service for 2,600F, a sum that rose to 4,000F at the outbreak of the Crimean War. This meant in theory that the demographic of the French army was very cosmopolitan, and contained men from the rural peasant stock to members of the bourgeoisie; indeed the ‘buy out’ price was gently increased to ‘encourage’ those of the middling sort to join the army. Only those who were wealthy enough could afford not to serve in the army by buying a substitute to stand in their place. That said, having money and influence did not necessarily mean the wealthier classes did not serve in the army; it was considered quite normal to find the son of a senior army officer or prestigious family serving in the army as a common soldier as this was a rapid route for promotion. Conscription, however, was hated and resented by all levels of French society; the middle classes saw the provision of a substitute as a form of heavy tax and conscription was not considered a duty to the community but rather as a heavy tribute imposed by an oppressive state. For the working class and rural poor, it meant the loss of sons for military service and therefore the loss of able hands at home, especially in rural communities where there was already a manpower shortage due to increasing urban and industrialisation under the July Monarchy and Second Empire. With memories of the Napoléonic Wars, many parents believed that being conscripted was the same as a death sentence. The ethos of the French army for much of the 19th century was to keep the army separate from society at large, almost as a caste apart. This was due to the fact that the army might be used to suppress rebellion, and to prevent sedition of the army by civilians. Napoléon III was in favour of a national army with short enlistment periods (no more than three years) and a very high ‘buy out’ price making the army a finishing school for its male citizens, instilling in them discipline and patriotism. His military advisors, however, were fundamentally opposed to this and believed the only way to ensure military loyalty was keeping a long-service army separate from society. After the first seven years service, a soldier could then sign on again for a further period of 3, 4, 5, 6, or 7 years. After seven years service there was an incentive to remain with the army in terms of a cash payout for re-enlistment as well as higher pay. For the first additional seven years service, daily pay was increased by ten centimes and the soldier received a cash gratuity of 100F upon retirement. If the soldier wanted to continue his service after 14 years, then he received an additional 20 centimes per day as well was a 300F bounty upon re-enlistment and a 700F gratuity upon retirement. Following the reforms of Marshal Soult in 1832 many veterans of the old Royalist army, and later in 1848-1850 those of the old Orleans army were gently 'encouraged' to leave and the retirement age was dropped to 47 and then 45. 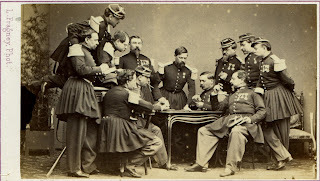 Early in 1855, during the height of the Crimean War, it was realised that a considerable portion of those men in the army and on active service would be retiring after their 7 years service was up, and in order to encourage them to remain in the army, a bounty of 500F was offered per soldier, under 35 years of age, who re-enlisted for a second period of seven years.They would also receive an additional 10 centimes per day and were eligible for admittance in to the Imperial Guard. This having not proved popular, the Minister of War on 14th July 1855 allowed a gratuity of 2,300F per soldier re-enlisting after their service was up: 1,000F upon re-enlistment and 1,300F upon retirement. Until success in the Crimean War, the French army was viewed with general disgust by society at large. This, combined with the relatively low status and pay for army officers meant that middle class and bourgeois families preferred to send their sons to more lucrative civilian posts. Overall French officers tended to be lower middle class in character: most aristocratic officers left the army in 1830 following the ‘July Revolution’; bourgeois officers preferred not to send their sons to the army whilst the lower middle classes, who could afford the education required for admittance to St Cyr viewed the army both as a profession and as a means of social advancement. The social base of the army the officer corps was further narrowed by the practice of the bourgeois and upper classes of ‘buying out’ from conscription, so that Infantry officers were predominantly the sons of artisans, well to do farmers and minor government employees; the largest proportion were sons from a military family. Further more, during the early yeas of the ‘July Monarchy’ when many aristocratic officers either left the army or were ejected, and the vacancies were filled either with promoted NCOs or by Napoleonic veterans who had been on half-pay for 15 years being re-called to the colours. Many of these re-called officers proved to be an embarrassment through their age, infirmity and not knowing the most up to date drill and regulations a situation made worse by the fact that good, long-service NCOs had been promoted to officer status! There was a perennial shortage of good NCOs in the French army, largely as a result of the tradition of promotion from the ranks. Excellent NCOs would be rapidly promoted through to officer leaving only the mediocre as long service NCOs. Furthermore, because the pay of NCOs (like the officers) was comparatively low compared to their status and strenuous list of duties, there was little incentive for good NCOs to stay with the army after their seven years conscription was up. The single biggest source of NCOs were the ‘army born and bred’ Enfants de Troupe. For example, a sergeant major earned 25.50F per month from which he had an outlay of 21.50F, paying for his own food, laundry bills, barber and maintaining his uniform and equipment. Long service was rewarded with additional pay, with up to an additional 10 centimes per day be granted per long service chevron (one presented every 5-7 years). The July Monarchy and the Second Empire went a long way to improve the status and pay of the NCOs but a consistent thorn in the side of army reformers was the lack of a specialist training institution for NCOs. Under Napoléon I there had been the Instruction Battalion at Fontainebleu to train NCOs but this was suppressed under the Bourbon Monarchy and despite the best efforts of Marshal Soult in the 1840s was never revived due to political opposition: middle class officers opposed it as it was felt to undermine the status and education of the officer corps, whilst conservative politicians and officers did not believe in educating the ‘lower orders’. There was, of course, for the eternally cash-strapped French army, the issue of cost and whether the army could afford such an institution. 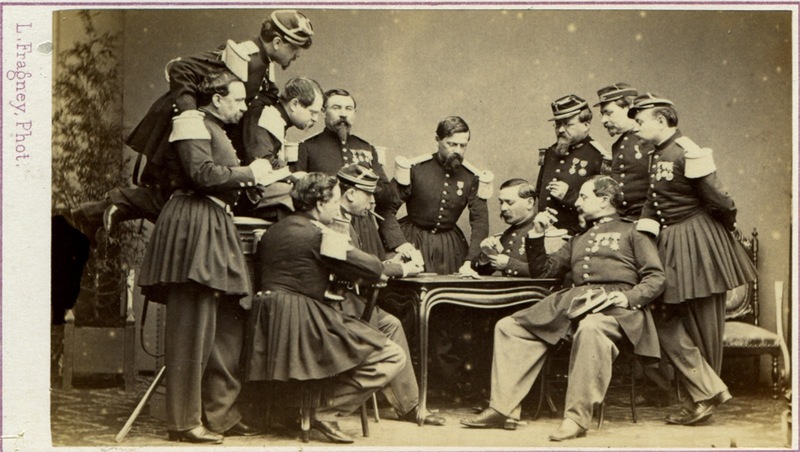 The officer’s mess was a highly stratified establishment; unlike in the British army where all officers messed and dined together, in France the mess was divided hierarchically. This was due to French officers coming from a more diverse social background than in Britain but also because of the huge difference in relative rank and income. Meals and accommodation were carefully calculated on an officers pay, so that a Sous-Lieutenant ate relatively meagre fair compared to a Chef de Bataillon or the Colonel! Furthermore, instead of dining at a communal table, each rank dined separately so that there was a separate table or dining room for the field officers, captains and subalterns.